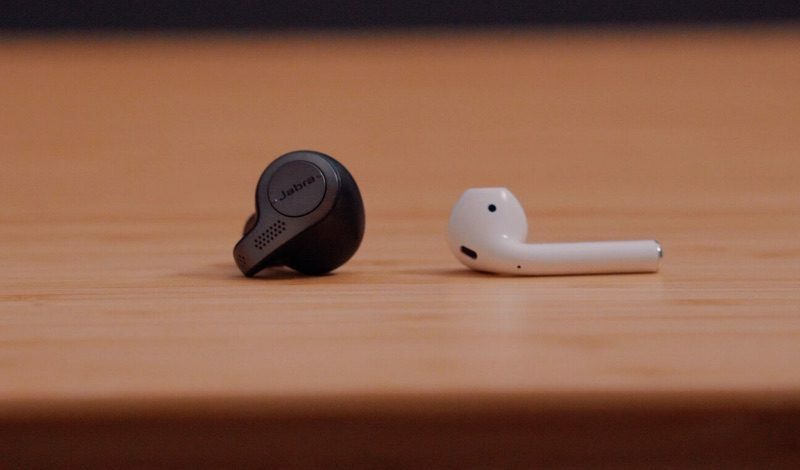 After Apple released its AirPods in late 2016, other headphone manufacturers have been attempting to compete with their own wire-free earbuds, most of which can't match the AirPods' comfort level, battery life, Bluetooth range, and ease of use. 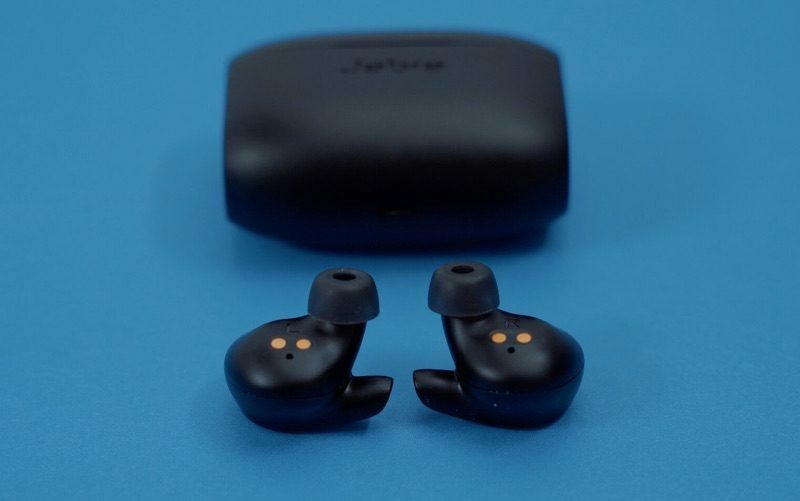 Design wise, Jabra's earbuds are denser and heavier than the AirPods, because each one is equipped with a battery, speaker, microphone, and other tech, and Jabra hasn't been able to condense these features down in the same way that Apple is able to. That said, they are small and tight fitting in the ear, which is a plus, but the weight makes them uncomfortable to wear for long periods of time. Given the snug fit, you can likely use these for working out, though Jabra does offer an "Active" version specifically for that purpose. Like the AirPods, Jabra's Elite 65t have buttons for doing things like pausing a song or changing the volume, and once you figure them out, the controls are easier than the double tap on the AirPods. One benefit - the Elite 65t look like a "normal" pair of headphones because there's no tail coming down out of your ear like there is with AirPods. Sound quality is one area where the AirPods fall short, with the Elite 65t offering noticeably better audio. In fact, when it comes to wireless headphones we've tested, Jabra's are some of the best sounding. Jabra offers an app where you can customize the headphones with music presets and an equalizer. Like AirPods, Jabra's earbuds offer five hours of battery life, with the case serving as a way to store and charge them. Jabra uses micro-USB to charge the case, which is not as convenient as Lightning or USB-C. There are four microphones in the Elite earbuds, so phone calls sound great, and the microphones are also used for voice commands. The Elite 65t have Alexa support built in, and there are options to use Siri on the iPhone or Google Assistant on Android as alternatives. Apple recently partnered up with Amazon to let Alexa activate Apple Music, but that's only on Echo devices. Jabra's earbuds are IP55 certified, which means they'll hold up to a bit of moisture, and there are some AirPod-like features, such as an option to pause music when an earbud is removed. In the app, you can also set soundscapes or do things like activate an option to amplify the sounds around you. The Elite 65t earbuds have some useful features, but as with all AirPods competitors, there's no way Jabra's earbuds can match the functionality added with Apple's proprietary W1 chip. 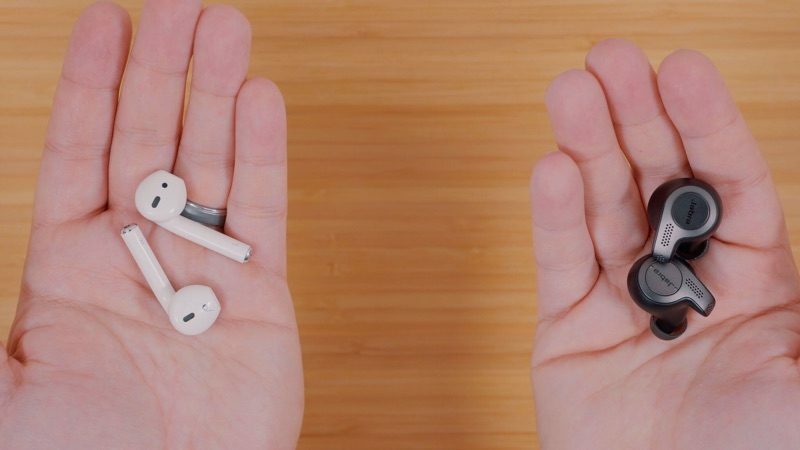 The W1 allows the AirPods to connect to an Apple device automatically, and it extends Bluetooth range quite a bit. What do you think of Jabra's Elite 65t earbuds? Let us know in the comments. I have the Jabras and they’re great. Sound quality is better due to the included tips, and the best part is they don’t make you look like you have straws in your ears. Doesn't each Airpod have battery, speaker, microphone, and other tech (W1 chip, bluetooth, etc.)? Yeah and you forgot the other part of that paragraph: "and Jabra hasn't been able to condense these features down in the same way that Apple is able to." Are you kidding me? Not a single mention of one of the 65t's major features - Noise cancellation. The AirPods don't even come close to comparing to the Jabras and they sound ****** to boot. You're either very biased and writing a desperate hit piece on Apple's behalf (imagine that) or you're something I'm too polite to suggest. I've gone back to wired. Bluetooth has been terrible for decades and still is. I can't believe in 30 years no one has managed to get it to be on part with wired. - Jabra has actual isolation and blocks significant noise, AirPod is open and doesn't block any. This makes jabra a lot better on e.g. transit or outdoor biking, better for your hearing since you can keep vol low. 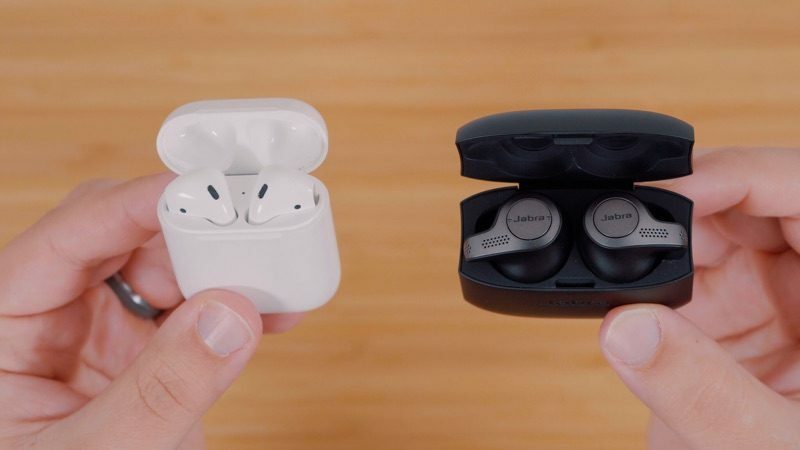 - You can use each side of Airpods independently, jabra the left side is "slaved" to the right side and can't function without the right side. - Battery-wise Jabra is actually 10-20% better in my usage (without the case). My AirPods battery are much worse now too. One of the best features I like about airpods? I can use them with my iPad, iPhone, Watch, and MacBook with no effort. Only had to pair to one device and it is available to all. I think the airpods don't get enough credit. I really, really enjoy using mine. Simple, elegant, effective.